Thanks, Jared. With a promise like that, I can’t refuse. Also, if you ever need it, my personal email is [redacted]. 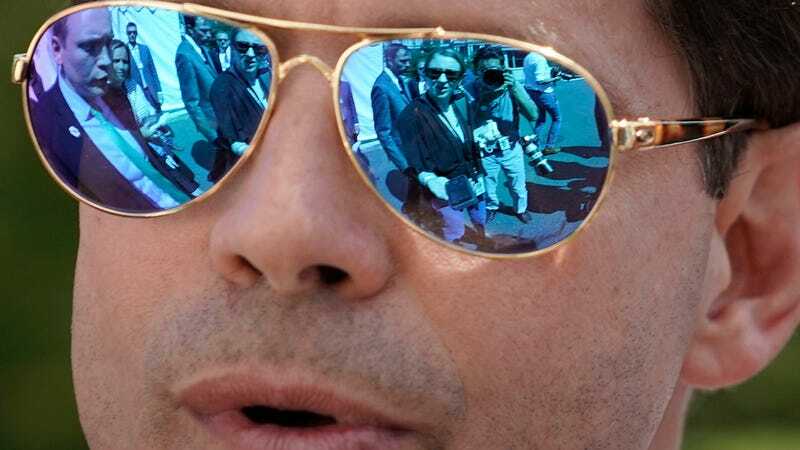 Scaramucci, who was ousted this week after his very public feud with former Chief of Staff Reince Preibus led to Priebus being kicked out too, fell for the prank as well ... while the prankster was posing as Priebus. @SINON_REBORN, under the guise of “Priebus,” seemed to successfully goad Scaramucci into getting very mad online. It’s unclear whether the email messages contributed to the feud, according to CNN. I had promised myself I would leave my hands mud free, but after reading your tweet today which stated how; ‘soon we will learn who in the media who has class, and who hasn’t’, has pushed me to this. That tweet was breathtakingly hypocritical, even for you. At no stage have you acted in a way that’s even remotely classy, yet you believe that’s the standard by which everyone should behave towards you? General Kelly will do a fine job. I’ll even admit he will do a better job than me. But the way in which that transition has come about has been diabolical. And hurtful. I don’t expect a reply. Though Scaramucci did not reply to the final message, it’s unclear whether that was because he had realized “Priebus” was a fake, or he was just getting madder. Who’s [sic] head should roll first? Maybe I can help things along somewhat. According to CNN, none of the officials involved clicked any email links, nor was the prankster motivated by anything more than “mischief.” But had any of them done so, said link could have easily led to any number of malicious outcomes—like a compromised email account or malware being dumped on their smartphones or computers. Look, phishing scams can hit just about everyone, and the Trump administration is composed of people who are just humans. Very, very dumb humans, who should probably not be trusted with any kind of serious responsibilities.